Estimate the precision of the measurement procedure. The worksheet opens showing 3 columns. The Sample column identifies the levels of the analyte in the sample (3 levels). Run identifies the day number of each run (5 runs). 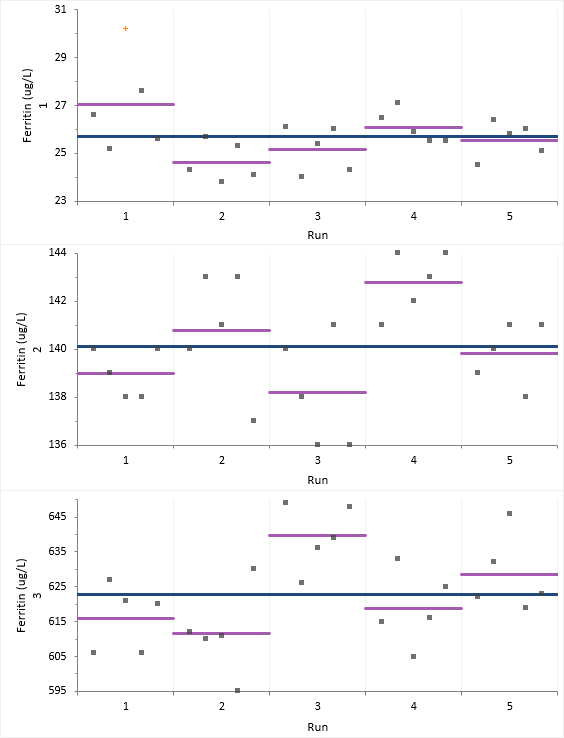 Ferritin (ug/L) identifies the measured value for 3 replicates of sample in each run. On the Analyse-it ribbon tab, in the Statistical Analyses group, click Precision drop-down, and then click 1 Factor. In the Y drop-down list, select Ferritin. In the Factor A drop-down list, select Run. Clear the Detailed components check box. The variability plots show a simple visual assessment of the closeness of agreement between the measured quantity values. The purple lines show the mean of each run and the blue line the overall grand mean, allowing you to see the variation between and within each run. You should observe the scatter of the points to ensure there are no obvious problems. If a result appears spurious then you should investigate and correct any mistakes. If the data appear to be unusable, stop the evaluation and begin an expanded evaluation of the sources of measurement error or contact the manufacturer. We note that one observation in Sample 1, Run 1 is highlighted as a potential outlier but do not know the reason for the aberrant result. We will continue with this observation included in the analysis and return to it later. The abbreviated variance components table shows precision expressed numerically as the standard deviation (SD) and coefficient of variation (CV).